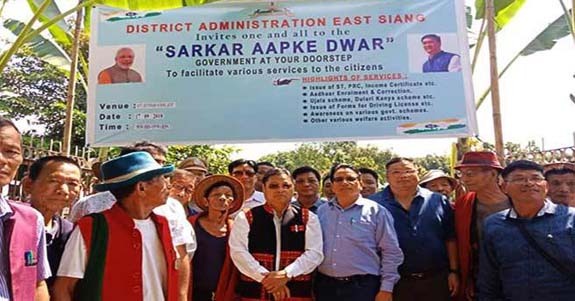 More than 350 villagers have been benefitted from the Sarkar Apke Dwar conducted in the remote village of Reying under Payum Circle in Siang district. This was claimed by the Arunchal Pradesh Government. The Information & Public Relations department on its official Twitter account on Wednesday also stated that the camp organised as part of the Sarkar Apke Dwar programme in Payum Circle of Siang district in the State altogether 13 far-flung villages in the remote circle bordering China were covered. The district administrations of different district across the State have continued to hold camp to provide benefits to the villagers under the Sarkar Aapke Dwar State Government. The fifth Sarkar Aapke Dwar of East Siang district was held at Yagrung Village on Monday. The camp was inaugurated by local MLA Kaling Moyong. More than 350 villagers benefitted from Sarkar Apke Dwar conducted in the remote village of Reying under Payum Circle, Siang District. The Camp covered altogether 13 far flung villages in the remote circle bordering China.